We asked some of the people at the Bergen Exchanges on Law and Social Transformation to describe the Exchanges in one word. “Transformative,” “Inspiring,” “Collaborative,” “Comprehensive,” “Exhilarating,” “Diverse” were just a few of the words they used. It really was all this…and so much more! The 2018 edition of the Bergen Exchanges was the biggest yet. Participants travelled to Bergen from institutions all over the world, from South Africa to India to the USA to Brazil, and beyond. Academics, students, practitioners and activists came together to share their research and thoughts about how law and courts are used to achieve social and political objectives and the effects of such lawfare. It was great to see familiar faces from the global LawTransform family, as well as new participants. In all, there were 95 speakers and panellists at this year’s Exchanges, and 35 PhD students. Does Norway fulfil its international commitments to child rights? Intersectionality – what is it? How can It be researched? This year, the focus areas were Child Rights and Health and the Law. Monday and Tuesday where dedicated to debates about how law and health interact, kicked off by Norman Daniels,’ key note on human rights and fair priorities in health. On Thursday and Friday, the baton was handed to the Child Rights team with discussions probing a range of issues regarding the rights of children, ranging from how these are treated in national and international courts to how to best integrate children meaningfully into policy-making and formal legal proceedings. In her key note Helen Stalford shared her expertise on child rights within the migration process. Leading legal anthropologist Sally Engle Merry delivered the Annual Lecture on Law and Social Transformation on Wednesday afternoon. Her timely address dealt with what happens when we measure social phenomena through indicators, how the construction of indicators shapes and distorts realities in the field – and why we still need them. In addition to the open seminars, the Bergen Exchanges also hosted a PhD course with participants at different stages of their PhDs. The Effects of Lawfare course discussed the concept of lawfare – the strategic use of right, law and courts for political ends – and how to measure the effects of law. The varied backgrounds of the students opened up lively debates and discussions. Students had the opportunity to share their current research, or project proposals, for feedback from other students and experts in the field, a fruitful exercise for all involved. The students also had the unique opportunity to have breakfast with Sally Engle Merry, and afternoon discussions with Norman Daniels and Helen Stalford where they shared ideas and gave advice about conducting research on challenging topics. The PhD course is part of the LawTransform INPART project where the Centre on Law & Social Trnasformation, with partners in Brazil, India, South Africa and the US, aim to develop better and more research based teaching on law and social change. However, the Bergen Exchanges is not all work it is also play! Every evening, there was a social event, a great opportunity to mingle and get to know everyone at the Exchanges. 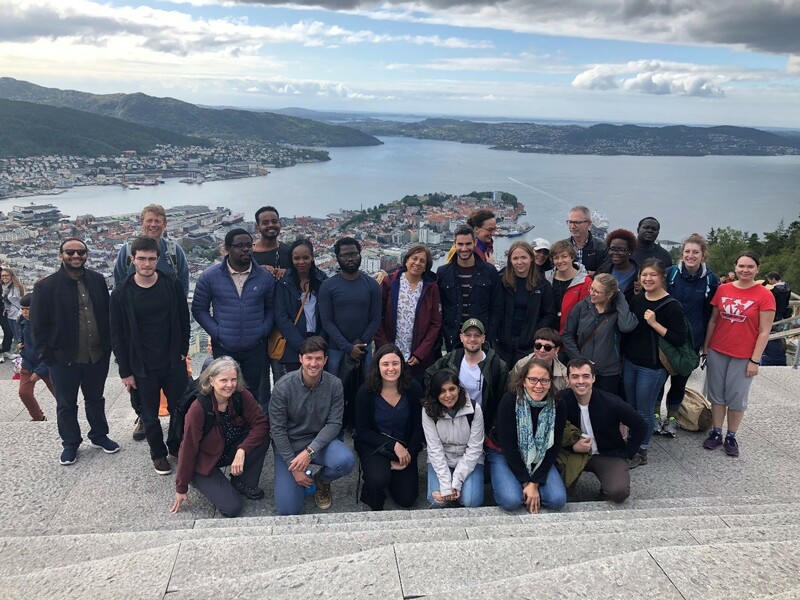 We were able to show our visitors some of the beautiful Bergen scenery with a nature hike through the hills to our director, Siri Gloppen’s house. We hosted the Evening Exchanges with panel discussions followed by dinner and entertainment led by our talented volunteers, course participants and academics. And after the Annual Lecture, the Municpality of Bergen – for the third year – generously hosted a reception for the Bergen Exchanges participants at historic Schøtstuene. The Bergen Exchanges are made possible by a dedicated team of volunteers who helped during the week and assisted with preparations before the Exchanges. Our 23 volunteers generously spent their week – and more – ensuring that everything ran smoothly at the Exchanges and looking after participants. Thank you! Bergen Exchanges 2019 – Watch this space! This entry was posted in Uncategorized on September 25, 2018 by AnnaG.